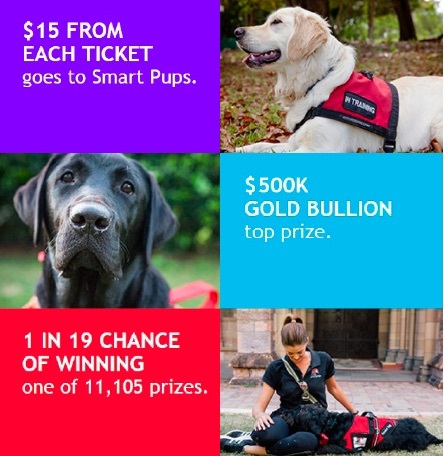 Smart Pups Assistance Dogs | It really is win-win! 21 Sep It really is win-win! The first Play For Purpose draw is less than a week away and we’re so thankful for all the support so far. For those who don’t know, we’ve partnered with Play for Purpose, the not-for-profit charity lottery that gives you the chance to win one of over 11,000 prizes. There’s a top prize of $500k in Gold Bullion and you’ve got a 1 in 19 chance of winning with every ticket. Tickets are $25, with $15 going straight to Smart Pups. It really is win-win! With more than 11,000 prizes to be won many supporters will win a prize when the winners are announced next week.